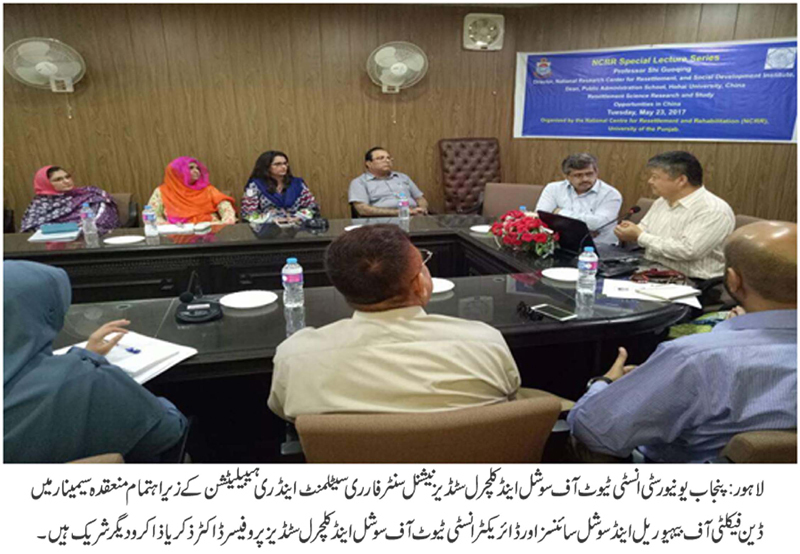 LAHORE: (Wednesday, May 24, 2017): As part of its special lecture series in the area of resettlement the National Centre for Resettlement and Rehabilitation (NCRR) at the Punjab University Institute of Social and Cultural Studies, a seminar was organized on ‘Resettlement Science Research and Study Opportunities in China’. Professor Shi Guoqing from Hohai University, China who is the Director of, National Research Center for Resettlement, and Social Development Institute and also working as resettlement and social expert in Dasu Hydropower Project was the guest speaker. 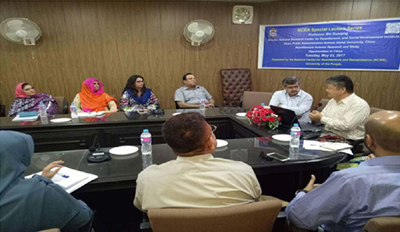 Dean Faculty of Behavioral and Social Studies Prof Dr Zakria Zakir, senior officials of NESPAK Mr. Irfan ul Haq, Mr. Imran ul Haq and Mr. Asim Khan, Mr. Nayyar Abbas and Ms. Rifat Naz from Dasu Hydropower project, faculty members and research scholars also attended the seminar. Prof. Shi in his talk emphasized the importance of CPEC and its socio-economic positive impact for Pakistan. In this regard, he also pointed out the importance of doing educational research in the area of resettlement. Furthermore, Prof. Shi shared the various study opportunities in the discipline of resettlement in Hohai University China. Prof. Dr. Zakria Zakar highlighted the role of universities in creating sustainable development outcomes.